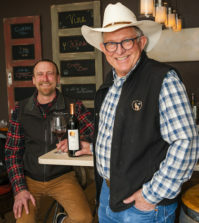 OLIVER, British Columbia — It seemed natural for Ray and Betty Coulombe to take over a vineyard in the Okanagan Valley that was dominated by Bordeaux and Burgundy varieties. However, before they developed what has become vinAmité Cellars in Oliver, that vineyard needed some reining in. 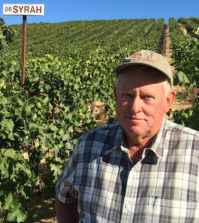 They grow Chardonnay, Gamay Noir and Cabernet Sauvignon, and they buy Cabernet Franc. Production stands at 1,200 cases, and their wines are earning acclaim and awards, including their standout estate Gamay Noir. 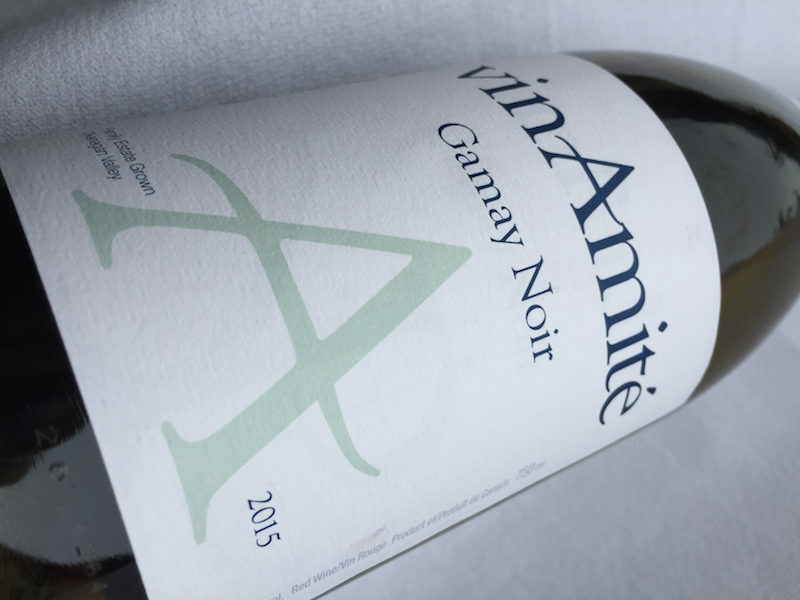 Last fall, the vinAmité Cellars 2014 Cabernet Franc earned a gold medal at the Great Northwest Invitational Wine Competition in Hood River, Ore. The 2015 Gamay Noir also earned a gold. A couple of weeks earlier, their 2014 Compass, a Meritage-style blend of Cabernet Sauvignon, Merlot and Cabernet Franc, merited a gold medal at the 2016 British Columbia Wine Awards. Coulombe is French-Canadian and works to reflect a French sensibility in his wines. Born in Edmonton, Alberta, he spent most of his career in Montreal, where he met his wife, Wendy, a native of Dearborn, Mich. Their daughters, Catherine and Nathalie, have since joined them in the business. Both were born and raised in Montreal. In 2013, the family began making wine — originally as vinPerdu — along the Golden Mile. Last summer, they rebranded as vinAmité Cellars at the urging of cult Napa Valley producer Amuse Bouche. 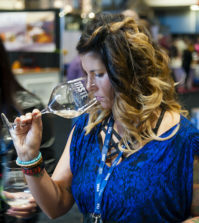 Its vinPerdu Red Wine has earned a string of high scores from the likes of Robert Parker and James Suckling, thanks to the Midas touch of superstar winemaker Heidi Peterson Barrett. “The First Lady of Wine” has been bottling vinPerdu going back to the 2005 vintage. The centerpiece of the Coulombe project is their tasting room, the Wine Lounge. It is designed to be a comfortable hangout, not merely a tasting bar. They make a point to offer a menu of traditional appetizers along with an impressive assortment of cheeses. His former life was that of a business strategy consultant, and now he’s learning winemaking from a consultant. However, he had the benefit of getting introduced to wine at an early age. 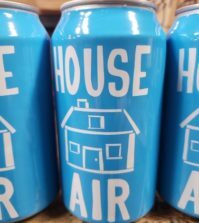 Both his father and grandfather made wine at home, although his grandfather made his white wine from dandelions and his red from Saskatoon berries. “That dandelion wine was pretty awful, but from the age of 10 I was always allowed a little glass of wine at dinner, and that’s how my wine education began,” he said. Coulombe also enjoys experimenting with grapes beyond their estate. Last year, he made five barrels of Port-style wine from Syrah and Cabernet Franc. 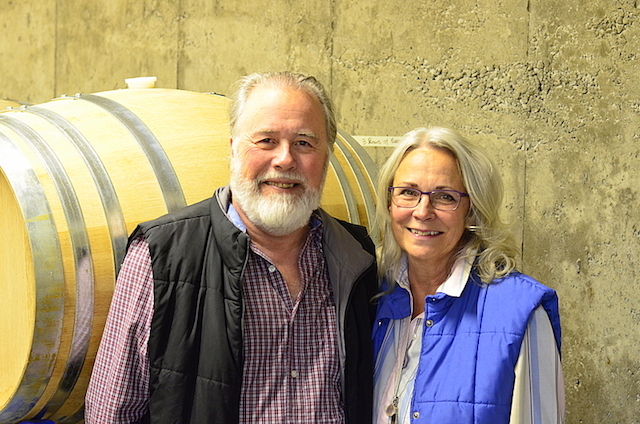 He and Wendy have trained and inspired help in the tasting room, the winery and the vineyard. Catherine was in the food and wine industry in Montreal, took several wine courses, and earned a Les Dames d’Escoffier scholarship in 2014. She moved to Oliver to join them in the winery but first worked for the Oldfields at Tinhorn Creek Vineyards. Catherine now is responsible for the food served at vinAmité, as well as being assistant winemaker. She is pursuing her Level 3 WSET. Nathalie’s move to the Okanagan Valley was shorter, arriving from Vancouver to join her family. She now manages her parents’ 5-acre vineyard, and she’s an accomplished painter, displaying her art in the tasting room. 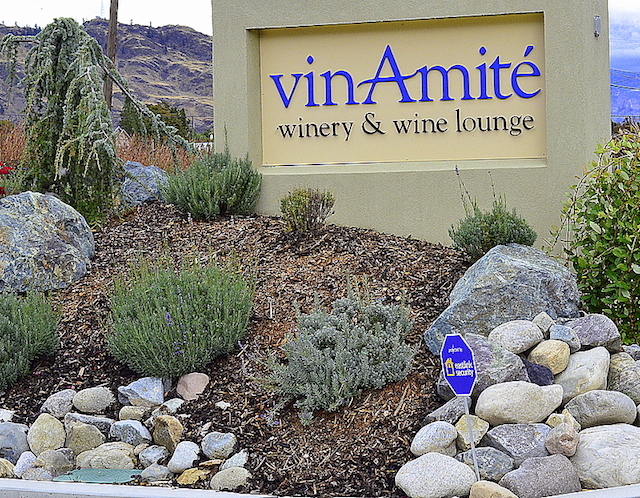 All four family members combine to create an enjoyable environment at vinAmité Cellars. “Wine should be conversation, food, laughter and friendship,” Coulombe said.